Sorry to take so long to get back to you. I had a great time in Victoria falls and everybody was very kind and helpful. Lorrie's place was a perfect meeting place and I got to meet quite a few of the locals in the short time I was there. Lorrie had some good ideas and can easily customise trips for visitors. It was a good place to be a single traveller and I really felt I had made a real friend, so thanks for putting me in touch. I look forward to your next news letter and wish you both a Happy Christmas and new year. If you don't already subscribe to this newsletter why not sign up now ! I promise to use it only to send you Victoria Falls Guide Newsletter . 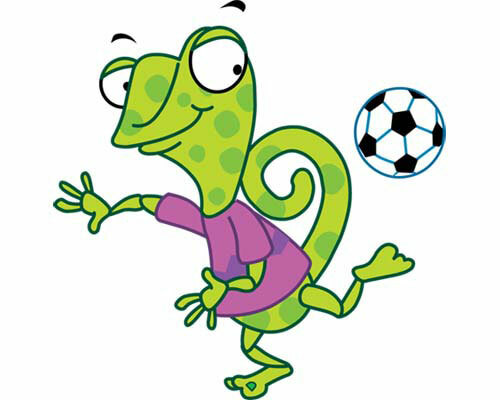 Count down to the 2010 World Cup in Africa! As a subscriber, you will get interesting news and events in and around Victoria Falls area. As well as hosts of other topics that you as a wild life enthusiast, adventurer, traveller and conservationist will enjoy! Please interact with us by letting us know, what you would like to see and also what you don't like, and of coarse share with us any stories you have that our readers will enjoy. Simply follow the links in the left hand column of this newsletter. We have had a very busy time since our last newsletter on the site and in the field. We had a very productive 10 days in Vic Falls mid December catching up with operators and "site inspecting" some new and exciting activities and adventures. Some of which are up on the site already and others hopefully by the end of January. We have also completely restructured the "Your Stories" section on the site, inviting our readers to submit their stories in various categories. If you haven't done so already -check it out here. 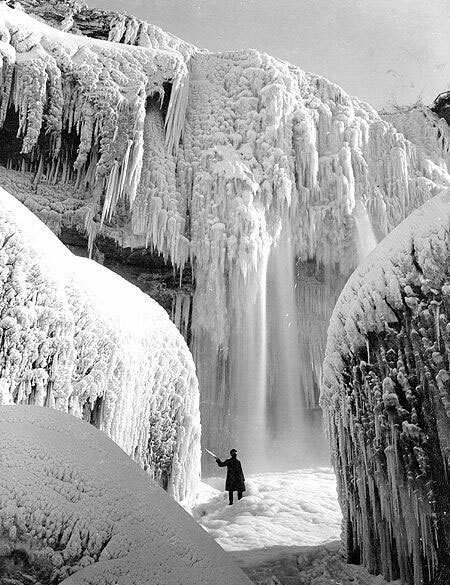 Please enter any story, advice or review that you might have and stand a chance of winning a fantastic set of Larry Norton prints. You might also want to book mark the Google News Feeds that we have placed on our Zimbabwe News, Vic Falls News and our Conservation pages these Feeds bring daily information on these topics from the whole internet. Lots of other new content and stories have been added and these are easiest viewed on our blog page. Don't forget to let us know if there is anything in particular you think that we should be adding to our site. Whilst we were in the Falls in December we were amazed to put in our Visa card at the ATM cash machine and receive brand new US$ notes - seriously good news! So travellers can now get US$ cash in Vic Falls - but only using a Visa card. Shearwater Adventures - are pleased to announce that they are now able to take credit card payment on site for all your activities - Visa ONLY. PLEASE NOTE – Historically, any passenger visiting Zimbabwe who may have left the country (E.G. a day-visit to nearby Chobe National Park or a day-visit to the Zambian side of the Victoria Falls) but intended retuning to Zimbabwe to overnight was not requested to reapply for an additional visa upon return. However, with immediate effect, Zimbabwe will be charging for re-entry visas for passengers who have left the country on a day trip. Our on-site representatives have informed us that any passengers leaving Zimbabwe on a day trip MUST purchase a multiple entry visa for Zimbabwe. We are thrilled to inform you that the Kariba Ferries are up and running again. Their return transfer from Milibizi to Kariba has in the past always been a very popular trip running overnight travelling the whole length of the lake. Welcome Back! - For scheduled dates and more information please contact us. THE Victoria Falls International Airport infrastructure has been maintained in good shape over the years making it competitive compared with other airports in the region, the airport manager, Mr Ephraim Masawi, has said. Speaking at commemorations to mark Civil Aviation Authority of Zimbabwe (CAAZ) Customer Service Week in the resort, he said tourists, tour and adventure operators, had commended the airport. “We are the first and last impression a tourist gets in the resort town and country at large as soon as he/she lands here. So we are happy to note that we have had little or no complaints concerning the infrastructure itself as we have maintained it over the years,” he said. A few weeks ago, just in advance of her 80th birthday, Margaet Eddie zoomed down Africa's Zambezi River in a whitewater adventure, capping off her latest intrepid travel escapade. Damiano, the bull we released into the wild in July 2008, is followed daily on satellite as he wears a collar donated to us by Elephant without Borders. His travels are amazing and he has wandered almost 100 kms north to Kazungula, back south to Deka River which must be 60 km from what used to be home and seems to have settled well into life in the wild. It is fascinating to follow his journeys and very satisfying. We have another bull, Jack, who is the oldest in our herd and we feel is ready for release. Hopefully we can get a collar for him, team him up with Damiano being in the right area, and release him within the next few months during the rainy season whilst we know he will have good feeding grounds on his release. Perhaps he and Damiano will stay together, perhaps not, but this will be their choice and then their lives are their own – of course we will follow up and endeavour to keep them safe but ultimately to release these wonderful animals back into the wild, is the dream of Wild Horizons. recovering from her snare injuries. As 2009 draws to a close, many folks are saying how great it is that the country appears to be returning to normal. (Normal, according to the dictionary, means conforming to the usual standard, type or custom.) Each to his/her own meaning of “normal” but if one looks back over the years, what is happening today is “normal” for us and quite frankly, we have not, for a very long time, enjoyed what we would like to consider “normal”. Although the shops are full of food and delightful goodies, nothing much else has changed and sadly, greed and corruption at the highest (and lowest!) level continues unabated. The stranglehold continues to be evident in our beloved Hwange Park with the devastating news of yet two more white rhino having been poached there recently. 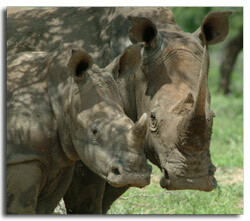 It is suspected that they were both pregnant females having been translocated from Matopos. What a total waste of life as well as time, finance and effort. We are so sad the year ends on such a sour note (and unfortunately there are still quite a few days to go!) but we can only hope and wish for a better future for our wildlife. We are considered “bunny huggers” but hey, would it not be an exceptionally sad day when our descendants no longer have any bunnies to hug? POACHERS see rhino as their way to get rich quick - for its horn is now worth more than gold for the first time in a decade. Demand in South Asia has doubled the price of horn, used in medicine, in just 18 months. It stands at £36,300 a kilo, while gold is £24,600. This property is 4 hectares in extent, and has title deeds. It has potential for future tourist development and has commercial rights. 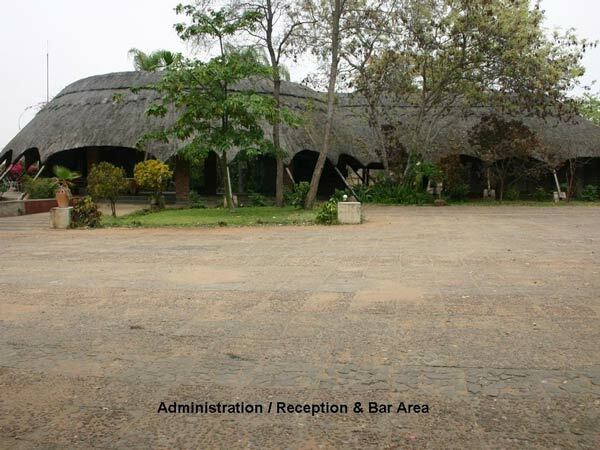 The property is situated near the big tree, adjoining the game corridor between the town centre and the Elephant Hills Hotel and is on the road to the Zambezi National park. Dinner Cruise - A Must Do! 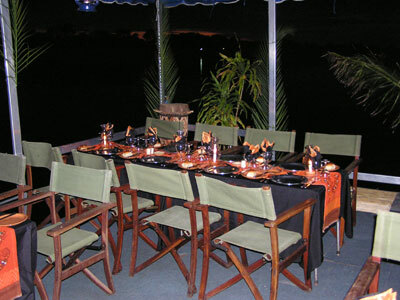 Bush Cusine have made a new breakthrough in the region by being allowed by National Parks to dine on the river at night. While all sunset cruise boats return to the shore we remain afloat the Mighty Zambezi to dine and enjoy the solitude of this majestic river. The experience of watching the sunset combined with a three course meal served by candle lite - is something not be be missed. The Zambezi River takes on a whole new feeling under the stars. 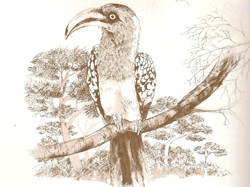 Although most bird-lovers know that the Trumpeter Hornbills of Southern Africa make their nests in hollow tree trunks, it is not everyone who knows that, once the hen has laid her eggs, her husband seals the entrance with clay. 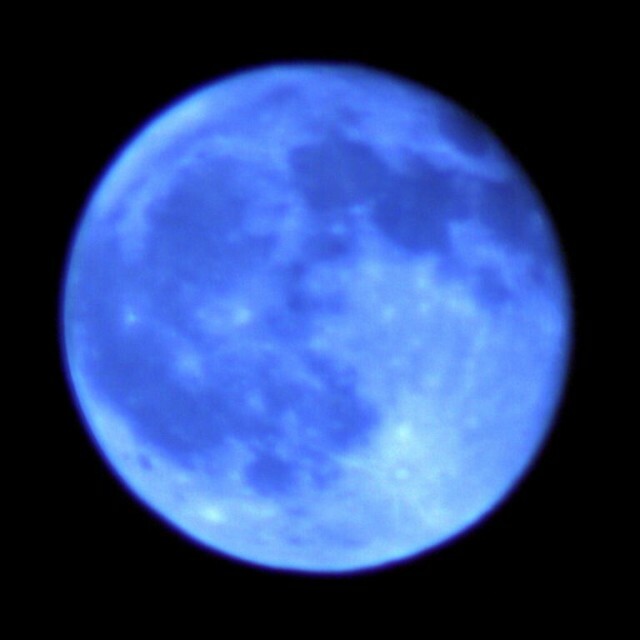 A Blue Moon is a Full Moon that occurs twice in one Month. That's right the saying "Once in a Blue Moon" is derived from the uncommon occurrence of a full moon happening twice in one month. The most recent happening of this was in 31st December 2009 when full moon occurred on the 2nd Dec and again on New Years Eve.